Calling all chocolate lovers! 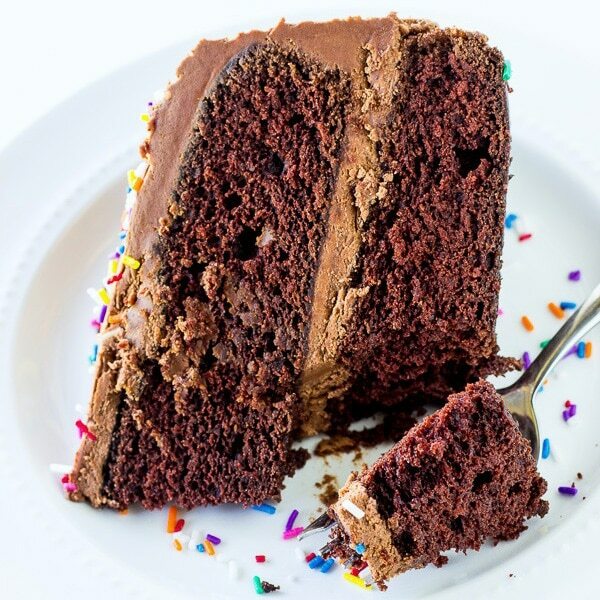 I’m so excited to share my favorite Homemade Chocolate Cake recipe with you today. ✓ DO NOT OVERMIX THE CAKE BATTER: When mixing the cake batter, do not over mix it. Over mixing will lead to a dry, dense cake. So once you add the dry ingredients to the wet ingredients, only mix all the ingredients until just combined (you will still see some flour in the bowl!). ✓ SLICE OF BREAD TRICK: Once the chocolate cake is done, place the two cake pans on top of a wired rack to cool before frosting. A little trick I learned is to place a slice of bread on top of each cake, this keeps the cake super moist when it’s cooling. You can also place two pieces of bread on each side of the cake, once you have cut the cake into to slices to help the leftover cake stay moist and not dry out. It’s the best trick in the book! ✓ MILK CHOCOLATE BUTTERCREAM FROSTING: I used my favorite Milk Chocolate Buttercream Frosting recipe for this cake. Here is my step-by-step on how to make the frosting. Also, if your looking to buy more SPRINKLES, I buy all my SPRINKLES here. PRE-STEP: Pre-heat oven to 350F degrees. Spray two 9-inch cake pans with non-stick cooking spray. Set aside. STEP 1: Using a hand or stand mixer, cream together butter and sugar until light and fluffy. STEP 2: In a medium sized bowl, whisk together flour, cocoa powder, baking soda, and salt. Set aside. STEP 3: Add eggs and vanilla extract to butter mixture. Beat for 1 minute at medium speed. STEP 4: Slowly, add the dry ingredients alternating with the water until creamy. Do Not Overmix! STEP 5: Pour cake mix into prepared pan. Bake for 35-40 minutes or until a toothpick inserted into the center of each cake comes out clean. Let cool before frosting. STEP 6: Place milk chocolate candy bar into small bowl. Microwave for 30 seconds intervals, stirring after each interval until the chocolate is melted and smooth. Set aside and allow to cool. STEP 7: Using an electric or stand mixer, cream together butter and powdered sugar together until light and fluffy, scraping the sides of the bowl as needed. STEP 8: Add heavy whipping cream and vanilla extract, and mix until combined. Fold in milk chocolate until fully incorporated into frosting. STEP 9: Frost cooled cake. 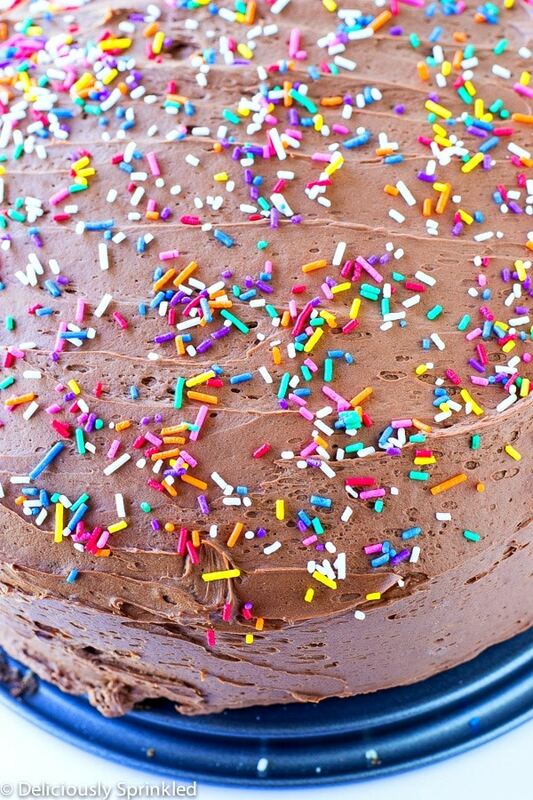 Top with sprinkles and enjoy! I can’t wait to try this recipe!!!!! Every part of it looks amazing! I was just wondering, though, is the frosting better kept refrigerated? You don’t need to refrigerate the frosting. This looks totally goofproof and absolutely, supremely moist and tender. Love good, old-fashioned classic recipes like this one! Yum! 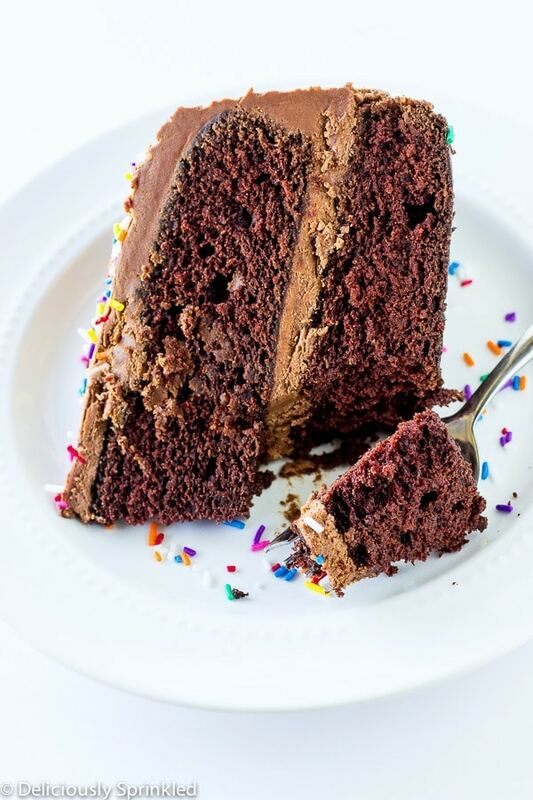 This cake looks beautiful and delicious. Happy Anniversary!! Cake.. it’s my love language! Nailed it Jenn!